I was at La Bodega, Bangsar Baru for drinks not too long ago and Syed (the restaurant manager) gave me a small cheese platter to try. Thanks! Picon Blue Cheese is a Spanish cheese made with cow, sheep & goat milk. It has a solid white flesh that is very creamy and intense, with a highly pungent aroma. I liked how its overpowering flavour pairs nicely with the tangy green apples. 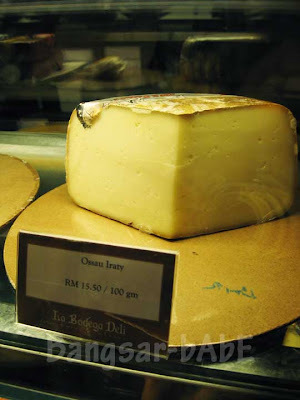 Ossau Iraty is a traditional, unpasteurized, semi-soft cheese made with the milk of Manech ewes (sheep). It is pale, medium-soft cheese with complex and delicately rounded flavours. The rind is tart, and slightly moldy. It is creamy, slightly nutty, not bitter, not overly sweet. I liked the finish of this cheese – rich and smooth, with a pleasant aftertaste. 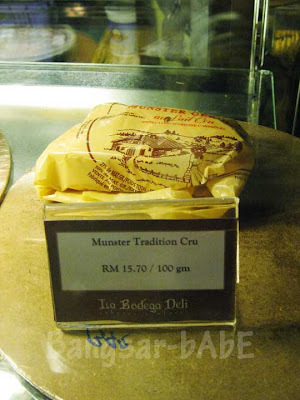 The Munster is a strong tasting, semi-soft cheese with a shiny brick red rind. This robust cheese has a pungent, penetrating aroma and piquant flavour. I actually detected a hint of smoked meat flavour (really!) when the Munster was paired with some apricots. 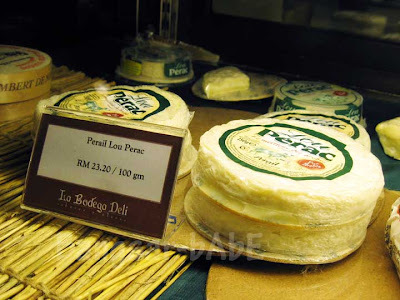 Perail is a traditional, un-pasteurized, natural-rind cheese made from sheep’s milk. 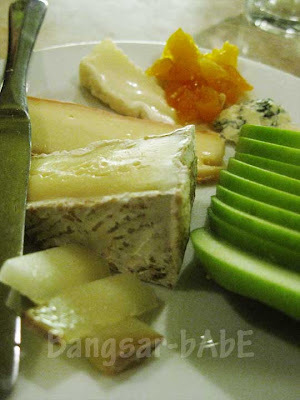 It has a very soft rind with a nutty aroma and a sweet flavour. Beneath the rind is a soft, glistening ivory paste that is creamy, supple and easy to spread. The aroma was quite subdued, but the texture was luscious and the flavours, despite the lack of character were well balanced. I liked this best. now that sounds like a good something to do on weekends. gather a few friends and cheese away. nice. I never know how to enjoy that kind of cheezie meals. Did once order when I was at melb and ended up ordering anther dish. Before, never really knows how to appreciate Cheese-more knowledgeable after this informative post. taufulou – Hehehe…have to get a cheese lover to teach you the difference between cheeses! Vivien – Errr…I dunno also. Suddenly only he came up to my table and gave me the platter. 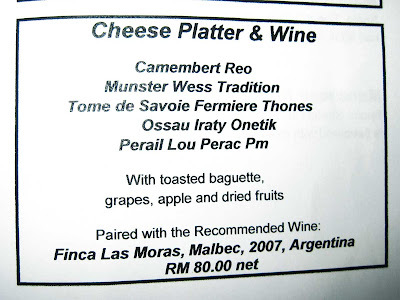 cheese platter's really hot in western countries, esp those fine dining ones. but seriously, to the untrained tongues (mine, hehe), i cant differentiate one from the others. or maybe i NEED that extra cheese in my life. Wow, lucky to get to try the cheese platter. Sounds interesting to try out different cheeses. Would be great to have them with wine. Sugar Bean – Yup, and I learnt about the cheeses and their origins too! 550ml – Hahaha…then you have to find someone who's not into wine! a cheese-addict like me is currently trying very hard holding back my cheesy-desire !! 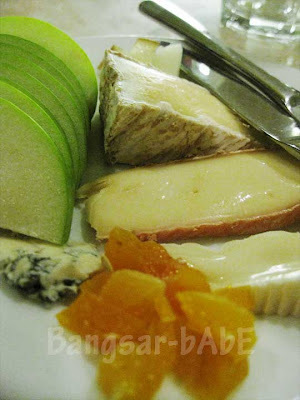 Seriously, most of the cheese u mentioned here are not like those commonly served platters elsewhr! I had cheese platters before but they don't serve me such exotic cheeses! 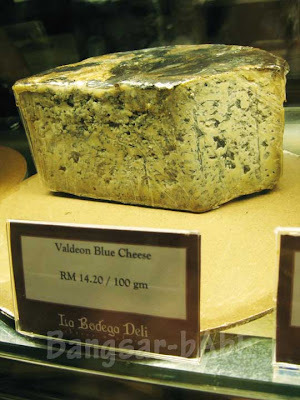 Never knew you could get such variety of cheese in KL! How times have changed! The cheese look in horrible condition – Camembert and Munster in particular look dried out as does the Valdeon which is crumbly. 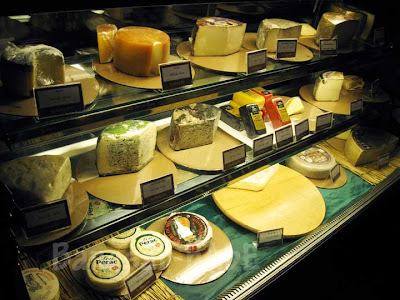 Problem 1) A key mistake that many restaurants make is that they buy in cheese and store in a fridge. The air in the fridge is too dry and the cheese dries out within 2-3 days of purchase. Worse, I can even spot some of the cheese just left unwrapped in the fridge. The cheese either needs to be specially packed (waxed paper, damp cloth etc.) or they need to invest in a special fridge with temperature and humidity control. 2) Buying too much. From your picture I spy 4 wheels of Perail. I don't know how popular cheese is in Malaysia and how much they intend to sell in a week, but buying so much doesn't make sense as a lot of it will be past the point of ripeness by the time it is sold. Simple analogy: cheese is like durian – from the time the fruit drops (the cheese is made) there will be a certain point where it is nicely ripe and at its best. Past this, it is all downhill. Certainly this is a mistake that even top restaurants make. The cheese are great and this is what I get in my homeback town France. By the look of it, I know that it is in good quality. Cheese does not need to be specially packed if they are stored in specialised fridge. genuiness – Thanks for the comment. I wouldn't know if the cheeses are in bad condition or not, as I don't eat cheese that often to differentiate which is good or bad. You seem to know a lot about cheese…so maybe you could write in and inform the management of La Bodega about this. Hazza – I didn't know that either…until that night! My Taste Heaven – Why hold back?? Cheese is yummy….